I decided to put out a nice big selection of my Easter decorations this year. We don't have a lot of space for displaying everything so usually it is just the mantle that gets decorated. Babies and toddlers definitely limit where things can be displayed. This year my wife is in Toronto for an extended visit with our daughter and her family helping with their brand new baby boy... I wish that I was there! All of the images are fairly large so that you can see the items quite easily, just click on them for a better look. As you can see all of the fun items are at the level that a child would love to get their little fingers into and rightly so these are childhood toys. 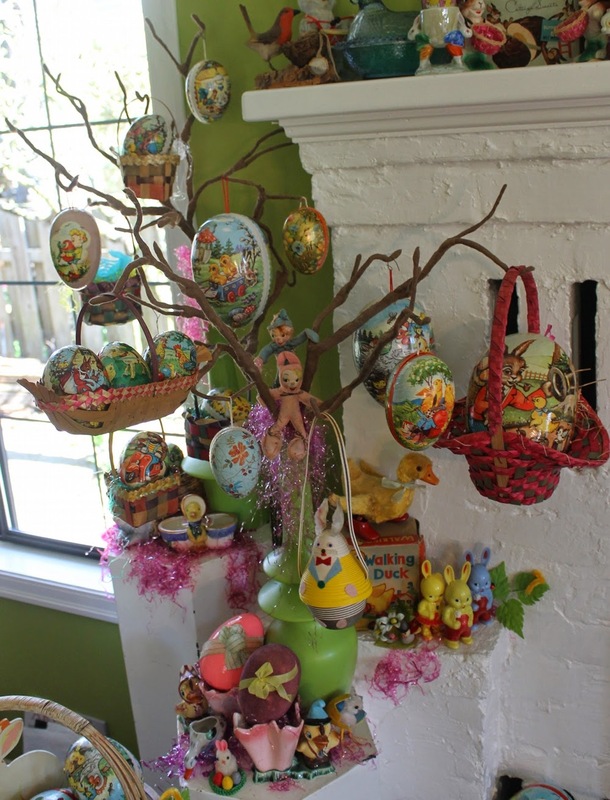 This picture shows the left side of the display, the Easter baskets on the hearth, cardboard eggs in baskets, toys, decorations, and vases... I love it! Here is a closer look at the items on the two trees. The trees were made from some branches that I built out of wire and painted cotton batting. I have used them over the years in window displays as well as at home. The narrow necked vases were filled with marble sand and then the branches stuck in the neck opening and then topped off with more sand. Vintage cellophane Easter grass hides the messiness of the neck opening. The sand is important, it gives a heavy base to stop the tree from toppling over. Here is a close-up of the items at the base of the trees. The rabbit that is hanging from the tree is a box or little girl's purse from Japan. 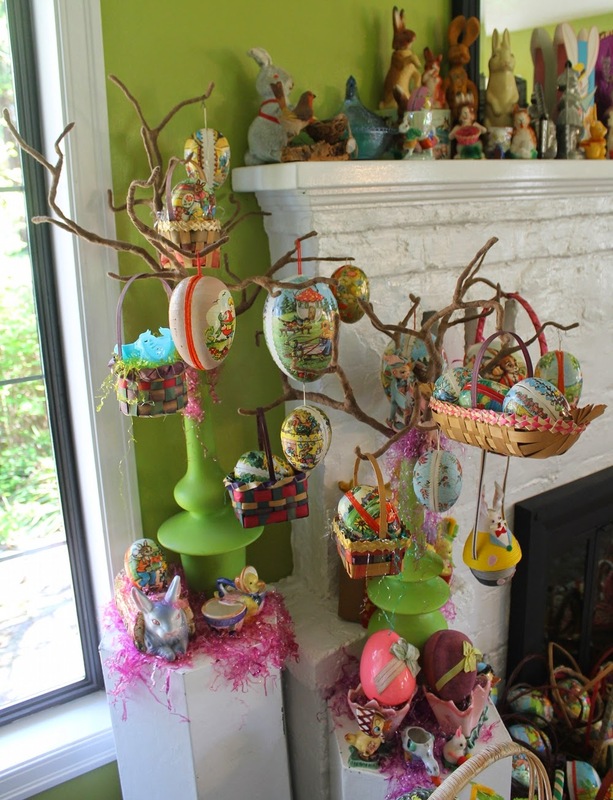 This side view of the trees gives you a better look at the hanging cardboard eggs. This is the view as you sit in the stuffed chair looking at the mantle. The side table beside the stuffed chair has two metal baskets filled with cardboard eggs. A clear glass rabbit jelly mould rests on the table in front of them. Flip the top of the plastic eggs and the chick's head pops up making a tiny squeak as it emerges. Of all of the cardboard eggs this is my favourite one. It is double sided and tells a humorous story. I have never come across another example like this. Here is the mantle display, the close-up images are below. I didn't get fancy around the mirror, I kind of wish that I had, but time was short. The bird standing by its nest is made of glue and sawdust I believe; I had to repair the section of the body where one of the legs enters the body and saw what it was made of. The nest is made of rattan woven with strips of loofa. It is standing on a base of cork tree bark. I bought this in the 1990's just after Christmas for around $1.75. The price may be wrong but it was not much more. The ribbon is still attached to it that held the chocolate egg in the nest. There is a foil tag that says, "Fry" on it, most likely Fry's chocolate but I could be wrong. I have a few of my egg cups on display in amongst the rabbit candy containers. The tall goofy looking buck toothed rabbit is English made of wired foam rubber. I wouldn't move the arms now to reposition it as I would possibly break off an arm or leg! Two antique chocolate moulds stand in front of a white plastic rabbit, an advertising bank for Wamsutta Mills. The centre of the mantle is a little less congested! The purple and yellow textile with hand-painted wisteria blossoms is a tea cosy. It is flanked on either side by two 1960's chocolate boxes. Standing in front of the tea cosy are two ceramic figurines marked Japan on the bottom that remind me of 1950's Italian fashion photography. Centred between the figurines is one of my favourite items, this salt and pepper shaker set. The hand-painted detail is delightful. The heads are the salt and pepper shakers, lift one out, use it, place it back, and the head nods back and forth. Like I said this is one of my favourite items. The plaque that is hanging under the mantle was in a bag of Christmas items that I purchased several years ago. It is made in Israel and depicts the moment that God tells Abraham not to sacrifice his son but that He would supply a lamb. Abraham looked up and saw a ram caught in the thicket. I forgot to mention that God had asked Abraham to sacrifice his only son as a test to see if he trusted God and would obey Him. Jesus was the lamb that God provided mankind. Just like Christmas Jesus is the reason for the season! HAHAHA!!!! and I love all of the silly bunnies, chicks, and other decorations that have nothing to do with Easter but are such a delight to see. I picked up these two jadite rabbits this year. Tucked in between them is the head of a rabbit covered in multi-coloured chenille. It was my mum's I think and all that is left is the head, I wish that I had the body to go with it, it would have been a wonderful piece. The brown chenille rabbit with the red coat is another one of my favourite pieces. Who am I kidding I have more than "quite a few" favourite pieces! The blue rabbit pulling the pink cart was mine as a child. The celluloid friction toy "Easter on Parade" I bought in the early 1980's for $7.50, that was a lot of money back then, especially for a young family on a tight budget. This shows the right side of the hearth and the raised display areas. The cardboard box in the shape of a train that is filled with the original plastic Easter eggs is from Australia, it was produced in the early 1960s I believe. The very realistic baby chick eggcup beside it looks contemporary but is marked Japan on the bottom, I think that it may be from the 1960s as well but I am not certain about that. The metal Easter half egg is early I believe but again I have never seen one before and do not have a date for it. The rabbit jumping over the red mushrooms is a florist vase or planter. The chicks standing between the egg shells are a salt and pepper set. The little ceramic rabbit beside the basket would have held a chocolate egg or a group of eggs but afterwards I don't know what the use would be as it is to large to be used for an eggcup. I stuck the chenille chick floral pick in behind the little rabbit girl hand puppet so that it looks like she is holding it. I really like the florist vase with the little girl sitting on the fence as the blue bird looks at her singing merrily she reminds me of my wife. The label on the plastic eggs on the wall says "A Lido Toy. LOOK! Eggs snap open and closed for easy filling. PLASTIC Easter Eggs." These are possibly some of the first plastic Easter eggs, the wording and the graphic presentation suggest this. The reverse is printed in French so it is obviously a Canadian item. The gold foil duck and chick I purchased at a florist wholesaler in the early 1990s, I liked them and thought that they were interesting. The three purple tulips are joined at the top of the stems just under the flower petls and form a vase with three openings. And now down to the hearth. 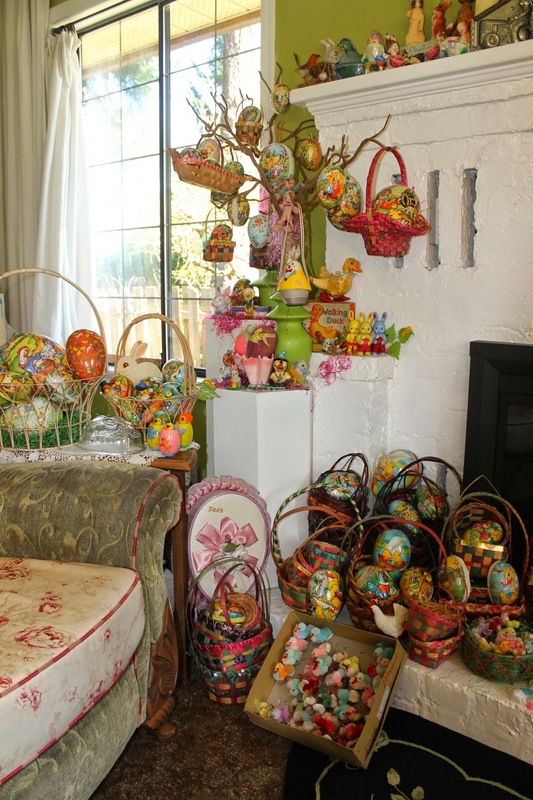 I have collected vintage Easter baskets over the years, I haven't seen any for at least ten years now. Most of these baskets are Japanese. The early Japanese Easter baskets are made of wood veneer, bamboo was used later and still is in use today. Bamboo is stronger and less likely to break, you can see that some of the handles on the veneer baskets have broken. The dark baskets in the background are from the 1950s. I have several halves of cardboard eggs. The other half may have gone missing over the years before I purchased it or possibly not. Chocolatiers would purchase the cardboard eggs and then use each half separately filling the half with chocolates and candy then possibly wrapping it in cellophane or a fancy ribbon. The cost of one egg would serve as a container for two items for sale on their counters. 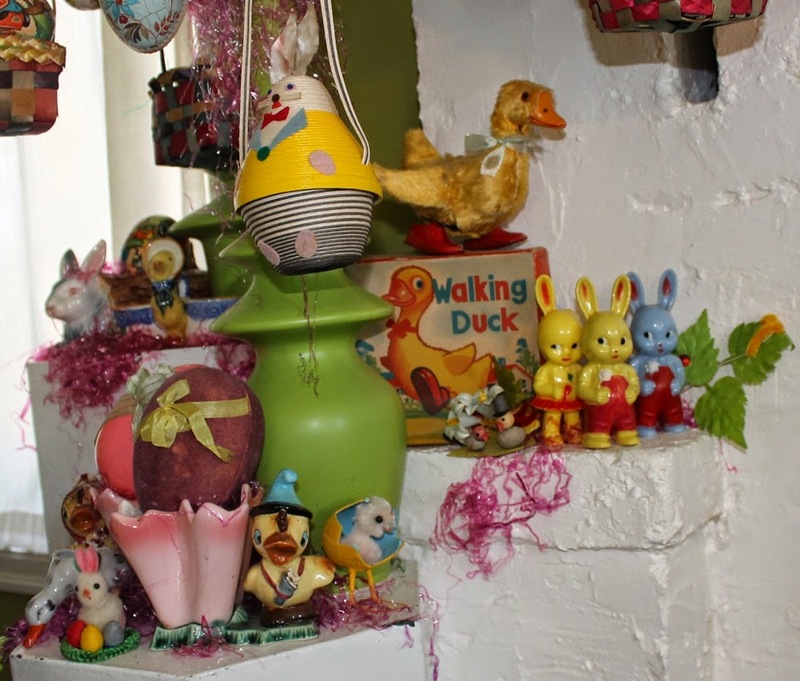 The large box of chenille chicks may have been sold from the box along with the rest of the trinkets to create an Easter basket or it may have come from a candy store. I have no idea of the original store that it came from but it is fun to imagine a scenario around an almost full box of pastel chicks. 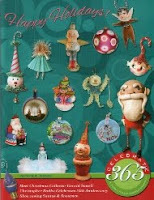 Oh, I bought it from an incredible antique store that had tons of holiday items in stock. Unfortunately it is long gone, even the building has been demolished. Lots of cardboard eggs and candy tins. I am not certain of the age of the egg shaped candy tin. The purple tin with the pansies is a British toffee tin. The pale blue tin with rabbit playing the violin is marked "Hong Kong" on the back. In the centre of the cluster of baskets and other doodahs on the hearth I have tried to give some semblance of order with this tidy bit of a display. The rabbit wearing an Easter bonnet is a British toffee tin.In front of it are two hard plastic cake toppers. Two baskets flank it on either side filled with more chenille chicks, roosters, and rabbits. The yellow ceramic rabbit would have been filled with candies and chocolates. A pulp cardboard rabbit is on either side, they are identical except one is white and the other pink. And that as they say is that! I have other blog posts showing Easter cards, postcards, egg dye packets, and a recipe for Hot Cross Buns. Click here, here, here, here, here, and here.